Like many teenagers, I had a variety of jobs in high school that helped me pay for my entertainment and modest personal expenses. One of the jobs, however, changed me in way that prepared me for my future teaching career. Towards the end of high school and into my college years, I worked at Development Homes, Inc., which gave me the opportunity to work with adults with development disabilities. I absolutely loved it and knew that I had to somehow incorporate that experience into my teaching. It was because of that job that I chose to focus my education on working with elementary students with learning disabilities. A few years later, I earned my Master’s Degree in Special Education with a focus on Learning Disabilities and Emotional/Behavioral Disorders. My undergraduate degree is in Elementary Education. Both degrees were obtained at the University of North Dakota in Grand Forks; right in my backyard. Every year, I end the school year and look back on some of the memorable events that have taken place during those short nine months. I have experienced so many wonderful moments. It is so exciting and encouraging when you can help a child understand an idea or concept that at first seemed impossible to them. One of my favorite memories involves a first grade student named Kalil. Anyone who has ever seen the television show Different Stokes will understand what I mean when I say Kalil looked and acted like young Gary Coleman’s character – sassiness and all. One day, I witnessed Kalil throw his shoe at another student during recess. The elementary school I work at has a zero tolerance policy for violence. Even though the shoe didn’t hit that other student, Kalil still needed to be disciplined. I asked Kalil to follow me to my classroom. His gaze immediately turned towards the ground. He knew he was in trouble. “What was that all about?” I asked him as we walked. I was met with nothing but silence. “Do you want to talk about it?” Again, silence. My room was not far from the playground, but the walk seemed very long. I’m sure it was even longer for Kalil. I have disciplined countless students over the years, but it is never something I enjoy. There is such a fine line between correcting negative behavior and damaging a young person’s spirit. Our school district is considered a high-poverty area (80% of the students qualify for free/reduced lunch). As a result, many students come from broken homes or dysfunctional situations. School is a respite for them, and they desperately want approval from us. I never want to do or say anything to take that sense of security and belonging away from them. As a result, I am very cautious in my behavioral modification approach. “I can understand that,” I replied. “I don’t like to be called names either. That doesn’t mean either of us can go around throwing books, though.” His gaze returned to the floor. Kalil had a habit of breathing faster when he was getting mad. It was his tell. His breathing had been getting faster as we talked. He looked at me, straight in the eyes. Without missing a beat, he said, “I’m disappointed in you, Ms. Larson. That’s not a very nice shirt. You know better than that.” I was a bit taken aback, especially since I really loved the shirt I was wearing. Apparently, however, not everyone shared my opinion. 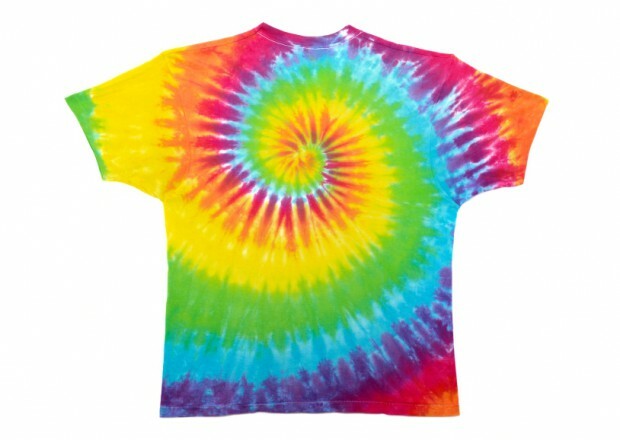 I couldn’t help but smile when I looked down at my brightly colored, tie dyed t-shirt. I had to admit, it was a bit outrageous! “Tell you what,” I said. “I’ll stop wearing this shirt to class if you stop throwing books. Deal?” I extended my hand, hoping to get a handshake. A smile came over Kalil’s face for the first time since the playground incident. “Deal,” he said, shaking my hand. Kalil kept his promise for the rest of the school year; and I kept mine. I still have that shirt, but I don’t wear it to school anymore! The best part of teaching is the unpredictability. As I said, I have a Master’s Degree in Special Education with a focus on Learning Disabilities and Emotional/Behavioral Disorders. After graduation, I got a job as a Learning Disabilities Specialist at Eastern Heights Elementary School in St. Paul, Minnesota. This year is my sixteenth at the school. I couldn’t ask for a better working environment. The model at our school is a combination of co-teaching (where I teach alongside a general education teacher in a class where the students I service are clustered in), push-in (where I go to support the students I service during the independent work time of the content area block they qualify for services in), and also pull-out (where I pull small groups of students I service into my classroom for remediation and instructional support). Besides my regular job duties, I am the advisor for the student council and the PTO vice-president. I enjoy both of these positions a great deal. I am also very engaged in building the relationship between community and school, and do so in a culturally relevant and peace promoting manner.